+Rep fast and easy, I even went first you can trust them. +rep, good and really fast idle! +rep Quick, easy, and fair. SCAMMER WHO GETS STEAM GAMES FROM DEVELOPERS AND SELL THEM ON HERE! This person sold me multiple games that were given by devs solely for the purpose of review. I was not aware of this during the whole time of the trade and then he blocked me. The games were activated as for "beta testing" (https://imgur.com/a/MqwAtES) and now can be revoked anytime. "I can't review them all so I have the right to sell them"
This review was posted to share my negative experience with this trader and to warn the community before they decide to trade with this shady user. As you can read yourself, this guy basically confessed to everything in his reply. 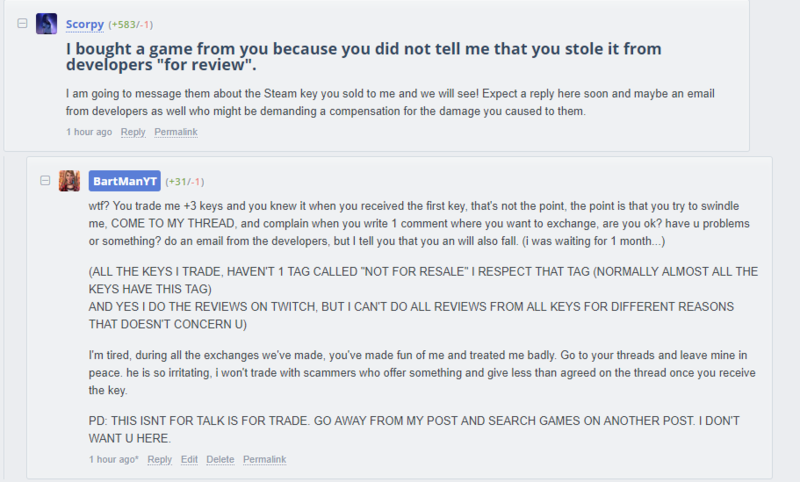 He nowhere mentioned that he sells stolen keys from developer and he made me to buy them without telling me a single word. Obviously I kept my part of the deal (https://imgur.com/a/0UKvn38), otherwise he would have posted some screenshots besides the lies about the "bad trade". On the other hand, I am glad that he confessed to what he's done. Thus, the review should stay on his profile as it is a valid warning. I am also waiting for any proofs confirming that I have ever threatened this guy or insulted him. He is just trying to play the role of a victim here to distract people from the fact that he sold me something that I was not aware of. His excuse for scamming is that he is a student and food costs money, like for real?! and I am aware of it. the problem "despite being very toxic (because it is) and believed superior in any trade despite doing unfair trades." He continued. WITHOUT TAG, which are the ones that I trade or simply play and test or do gameplay/review. the trades that I have been able to do, this has been the worst. I wanted to solve it and he used his superiority to threaten me more and more. It's not a good trader, it's disgusting person. do a raffle if i want because the keys havent the tag , the tag "NOT FOR RESALE" talks about all that and explains that you can not profit or give them away. There were many problems on his part, since he only threatened me and laughed at 90% of the conversation of the trade. please community remove this review, I don't deserve it and I have behaved well at all times, face to face with him, except he . he believes that he is superior, lacks respect and I do not want to meet users like him and I am sure that neither do you too, I want a healthy community, not a person that threatens insult and he makes fun of you because you have less reputation than him. +rep very honest and trustful trader. Highly recommended. +Rep. Friendly and fast trader. Excellent Idler, fast and friendly.